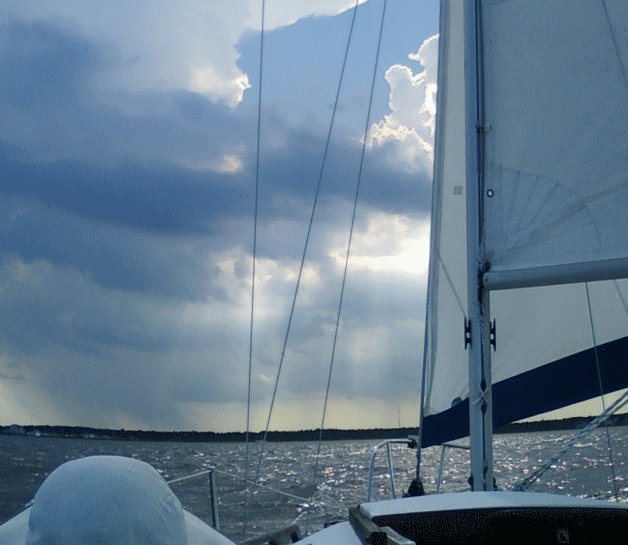 We got kind of a late start, but we did get some sailing in despite the threat of thunderstorms in the forecast. The wind was from the south and fairly calm. My initial plan was to beat south so that we could come back with the wind, but there was a big powerboat anchored kind of exactly where we needed to go. We would have had to tack to get around him and Jen had just finished raising the sails and prepping the boat, so we just headed down and went in the opposite direction. We were going with the flow with a pretty large flotilla of sailboats…not sure what they were up to. They were all going way faster than us, and I assumed it was because they were much better sailors and had so much more LWL and all of that, but after a couple passed us on bare poles, I realized that they were motoring. We couldn’t keep the jib from flogging on a broad reach, so we just pulled it in. The only other boat that seemed to be operating under sail along was, of all things, a MacGregor 26X (I’m pretty sure). I didn’t want to get too far away from Trixie’s in case storms popped up, so just inside Marker 39 we deployed the jib and started beating back. The wind picked up and we actually got our heel on a little which was fun, and notably well controlled. Sure enough, when we pulled about even to Berkeley Island, the sky to the west was looking kind of nasty and we decided to call it. We could see rain and actually some distant lightning. We did get some pictures of the storm on the way back, even though they’re just camera phone shots. We actually had a pretty technical sailing day for us, with lots of tacks and jibes and multiple deployments of the headsail. Jen also drove us to the dock under power, which she hadn’t done before. It was a good day to try it, with wind right on the nose, and she did a great job of smoothly guiding us in.